There's a lot that goes on in the body after we eat. And often we take these processes for granted. Understanding how the system works, and helping it along will help your body function at a higher level, feel better, have more energy, and lose unwanted pounds. This is especially important as we get older and things don't work as well. All of this starts in the stomach and intestines, where the digestion processes take over and converts the food into utilizable molecules that can be absorbed and transferred to the liver. In the liver, all of the vitamins and minerals become activated in a way that the cells can use them. Similarly, the energy in the food gets stored in the forms of fat and glycogen (stored sugar). All of these functions require the liver to activate different genes, create RNA "instruction manuals," and then build new proteins to handle this change in metabolism. 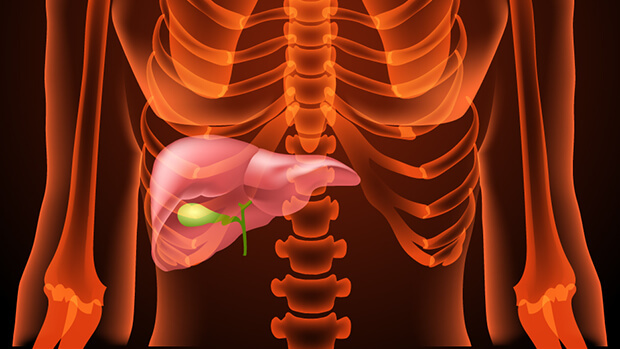 This is a huge undertaking, but the liver typically accomplishes it within about half an hour. And until recently, scientists weren't sure how it actually accomplished this incredible feat, even though it happens several times a day. Finally, researchers at the Salk Institute had a breakthrough in their investigation of this subject, publishing their findings in the journal Cell Metabolism. It seems that liver cells stockpile pre-RNA molecules needed for both glucose and fat metabolism so that they're prepared to make a switch at a moment's notice. The researchers knew that an RNA-binding protein called NONO plays a role in our circadian rhythms. But they weren't sure how it related to the liver. Upon further investigation, they found that when mice ate, their NONO levels increased in their livers, attached to RNA molecules. And within 30 minutes, the proteins that relied on NONO-bound RNA were present. The researchers tried taking NONO away and found that without it, it took the mice over three hours to generate the proteins - way too long to address a sudden influx of sugar. Because the slow response time had such a significant effect on blood sugar levels, the researchers are wondering if NONO may be able to play a role in treating diabetes in the future. NONO could also prove to be useful in combating obesity. This information helps explain why you need to feed your body the kinds of foods and combinations of fat, carbohydrate, and proteins that it needs. Since we are all different, in many cases, only testing and working with a practitioner versed in individualizing diets can provide you with the information you will need to determine exactly what kind of diet is right for your genetics and lifestyle. Certainly, this new study underlines the importance of the liver. Your liver works hard for you. Making it do more work than you have to creates a condition called fatigued liver. This condition becomes more and more common as we age, as the liver becomes less efficient and may be bogged down by a diet that is less than perfect, pesticides, heavy metals, chemicals, and other pollutants. A fatigued liver can make you feel fatigued overall, and it has a harder time making this switch to handle glucose, keeping your blood sugar at unhealthy levels. The good news is that there are nutrients that can help detoxify your liver and give it the nutrients it needs to work more effectively. And eight of the most powerful have been combined into Advanced Liver Support. If you have never tried taking a liver remedy before, you should give it a try. You might notice a better digestion and more energy. Just take one pill, twice a day.